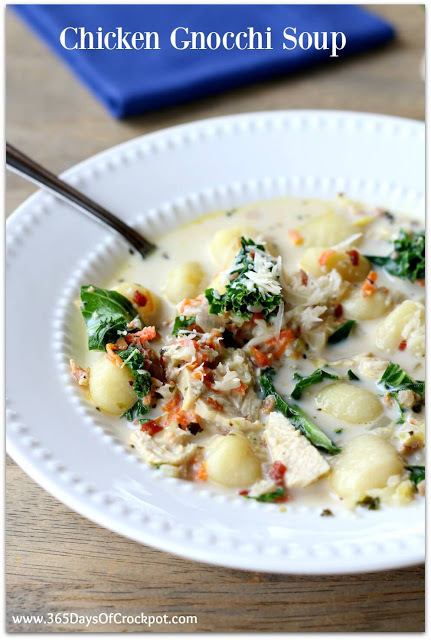 Slow Cooker Chicken Gnocchi Soup with Kale and Parmesan: A cream based soup with tender, moist bites of chicken, bacon crumbles, bright green leafy kale and dumpling-like gnocchi. This soup is a 10 out of 10 at my house. If I start a soup restaurant and can serve only 3 soups this will be one of them. I love the mild temperatures of September and early October. The 60s and 70s seem just about perfect to me. Now that the weather has turned this week and we’re in the 40s here I’ve been a tad depressed. That is until today. I made the best soup ever. And I thought “having bad weather is worth it if I get to make and eat this soup!” My son who can be quite dramatic about food (he loves it just about as much as I do), freaked out over this soup. “Mom, I love this soup!” As he proceeded to gulp it down and ask for two more bowls. All the flavors in this soup just mesh perfectly. I totally feel that this is restaurant quality soup! Make it for dinner, make it for potluck, make it for your neighbor, make it for book club, make it for the holidays…just make it. 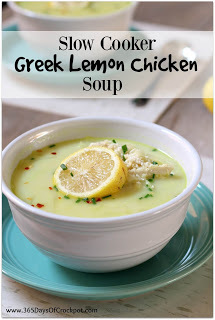 This soup starts with boneless, skinless chicken breasts. I decided to go with breasts because there is enough liquid surrounding the chicken to keep it moist. I also felt that there was enough indulgence in the soup with the half and half and bacon that we didn’t need to add more fat with dark meat chicken. 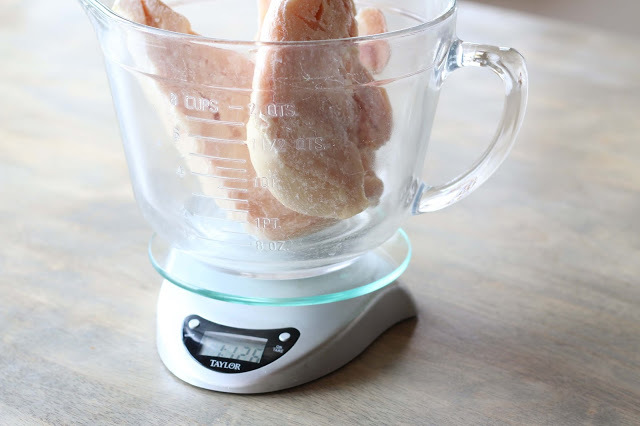 I threw my chicken breasts in frozen and I used 1 3/4 pounds. Which was plenty. I love my kitchen scale and use it all the time. If you don’t have one they are a good little tool and are pretty inexpensive. Next, chop up some onions, carrots and celery. 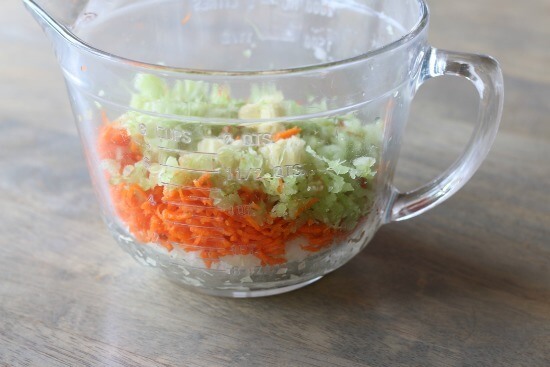 I actually really liked grated carrots in this soup instead of sliced carrots. Instead of sauteing on the stovetop we are going to use the microwave. We are going to add in a bit of oil and the spices and microwave it all for about 5 minutes. This gives the veggies a chance to soften up and it blooms the spices at the same time. Add all of that into the slow cooker along with some chicken broth and a bay leaf and you’re set to cook on low for about 4 hours. Once the chicken is tender, you’ll add in some half and half and some bacon. 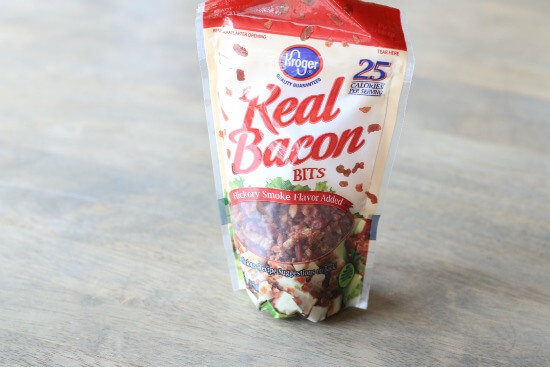 I like buying these little packages of bacon because it’s just really easy and convenient. But if you want to fry up some bacon, more power to you! 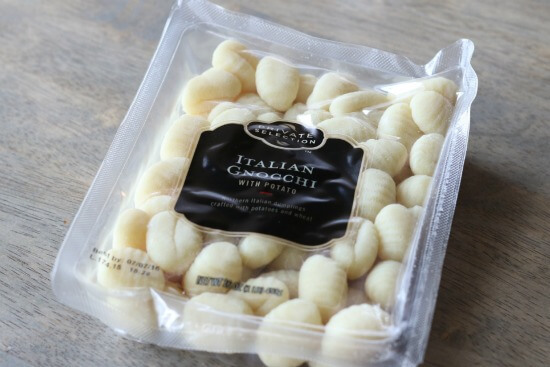 And don’t forget the best part…the gnocchi. I just like saying that word a lot. Gnocchi! I found mine at Smith’s/Kroger by the pasta. It was $2.50 for a pound. I think you could actually add more than a pound in this soup and it would be awesome. 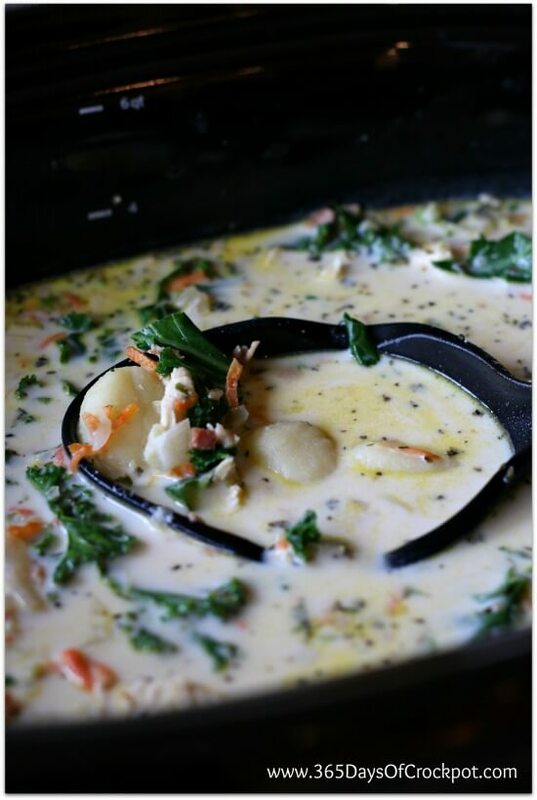 These cook fairly quickly in the hot soup so you’ll be ready to eat in no time! Don’t forget to add in a pop of green and nutrition with the kale. Make sure to take out the stem when you chop it up. Here is a one minute video that shows how to cute up kale…so helpful! 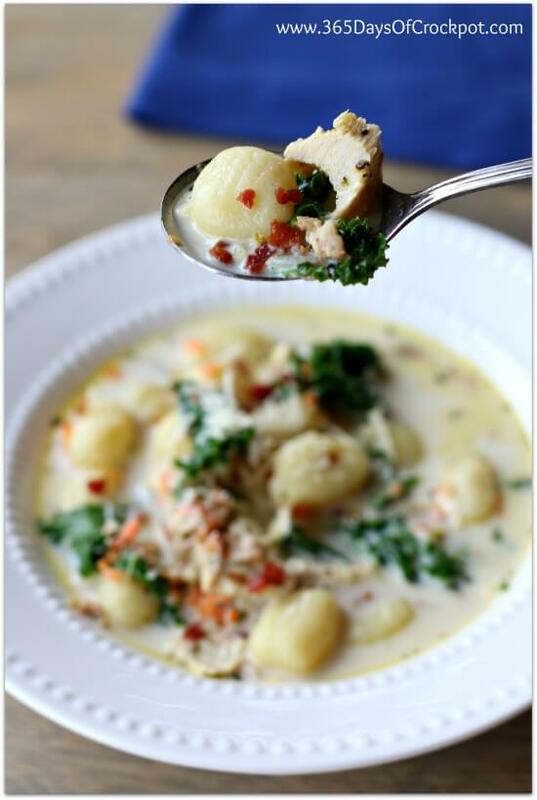 A cream based soup with tender, moist bites of chicken, bacon crumbles, bright green leafy kale and dumpling-like gnocchi. This soup is a 10 out of 10 at my house. If I start a soup restaurant and can serve only 3 soups this will be one of them. Place chicken in the bottom of the slow cooker. 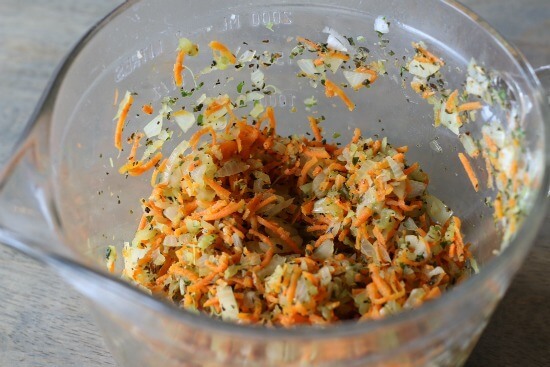 In a microwave safe bowl, combine the onion, carrot, celery, garlic, oregano, basil, parsley and olive oil. Microwave on high for 5 minutes, stirring halfway through. Add concoction to the slow cooker. Add in the bay leaf, pepper, salt, and chicken broth. Cover and cook on LOW for 4 hours, or until chicken is tender. Alternately, you can also cook on HIGH for about 2-3 hours. (I do feel that chicken turns out better in the slow cooker when cooked on low though). Remove chicken and place on a cutting board. Turn the slow cooker to high. Mix 3 Tbsp of cornstarch with an equal amount of water and stir together until smooth. Stir into the slow cooker and keep the lid off. Go back to the chicken and slice it into bite size pieces or shred it. Add the chicken back into the slow cooker. Warm the half and half (or else it will curdle) and add it into the slow cooker. I always just stick mine in the microwave for a couple of minutes. Add the bacon bits, gnocchi and kale into the slow cooker and give a little stir. Let it cook on high for 10 minutes. Ladle into serving bowls and top each serving with a tablespoon of Parmesan cheese. 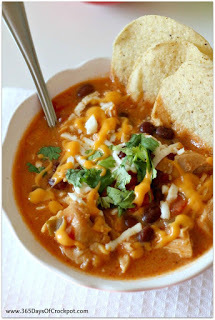 I use my 6 quart slow cooker for this recipe. 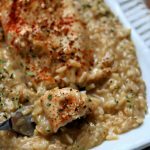 If you’d like the Instant Pot version of this recipe click here. P.S. Do you love soup? 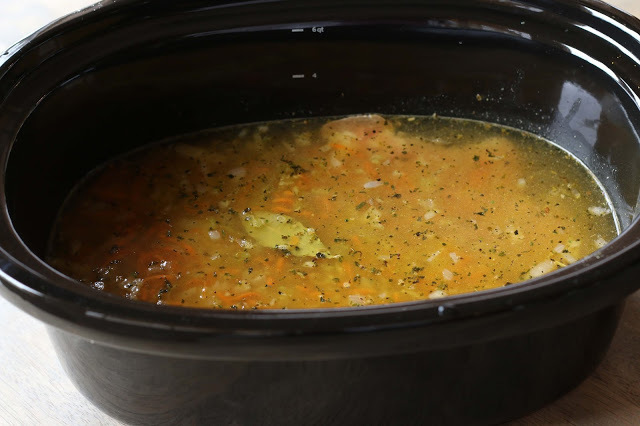 Click here to see all my slow cooker soup recipes! 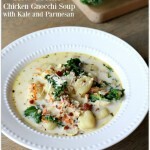 Made this soup this evening in my IP using gluten free gnocchi. It was fabulous. Thanks for all your wonderful recipes. Just made this for dinner and followed the directions and recipe exactly and it didn’t have much flavor… it was also very bitter, because of the kale we’re guessing, and we just couldn’t eat it. Very disappointed! Hi! I just found your site and am THRILLED!! 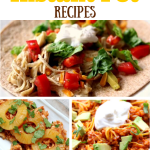 Your recipes look DEEE-lish and will likely keep me quite busy trying things out for my kiddos and I.
I have the chicken, etc. cooking, and just realized I have frozen tortellini, not gnocchi (could’ve sworn I grabbed gnocchi too, ugh)! Do you think this will work? I have the cheese version. If so, would you say about the same amount of time, prior to serving? I am actually cooking it now primarily for the week’s lunches (tho will likely sneak a bowl b4 bed, myself.. ). 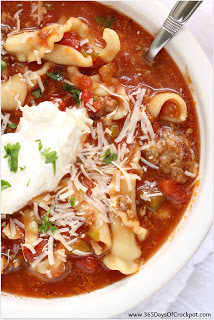 If I refrigerate once done, AND you think the tortellini will be okay, will the tortellini also be ok in the soup/refrigerated the next few days? Thank you SO much for this… your site/recipe had the BEST directions, simple, straightforward, and covering most all of the questions I had running thru my busy head!! I am a definite new follower! Hi Jess, glad you found me! I think tortellini would be just fine. I bet it would take the same amount of time. Yes it will be okay in the fridge. It might get a little bloated but it will still taste great. My son’s primary food groups are chicken and bacon, but he is allergy to all dairy products. I’ve never bought gnocchi before; does it have cheese in it? 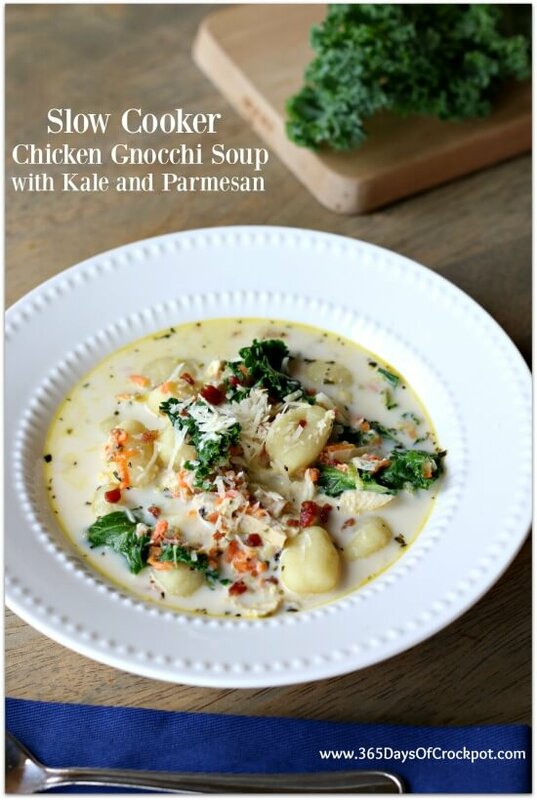 I’d like to try this recipe using unsweetened almond milk instead of half and half and Tofutti (non-dairy) parmesan cheese. I really like that this is thickened with cornstarch, not flour, since my cornstarch says it contains calcium—a bonus when allergic to dairy. Anyone else tried using non-dairy substitutes? Gnocchi is just a pasta made from potatoes. So no it doesn’t have cheese in it. Let me know how the non-dairy version turns out! I made today. Very good I used light cream instead of half and half. But it was delish and filling. Can you freez it .it is quite a lot for 1 person. I’m sure you could freeze it! Do you know the nutrition info for this? Can nonfat half & half be substituted? Oh my goodness! 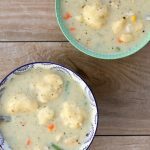 This soup is Ah-mazing! When my husband called and asked what I was making for dinner, he got really quiet. See, he’s not a soup eater. 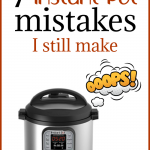 Especially if he knew it was a slow cooker recipe. He thinks things taste weird. Boy did this soup prove him wrong. He kept repeating “this is fantastic”. He told me that I hit it out of the park with this one on the first try. This is a keeper and will be made often. Super excited to try this recipe tonight! I’ve been using your beef stroganoff and quinoa avocado bowls forever and am expanding my crockpot repertoire now that it’s freezing in Michigan. Thanks so much for all the great recipes and pictures! I just used one of your Amazon links to order some items and will make sure I use your referral links in the future too. Katie, thanks so much for the nice note. I hope you find lots of great recipes!! Followed the recipe exactly, and wow! What a treat! FULL of flavor. Instant favorite. Thank you! What can I replace the chicken with to make the dish vegetarian? I would just leave it out. I’m not sure what you could use in its place that’s meatless. Maybe mushrooms? I’ve never tried it! But I bet it would be okay. 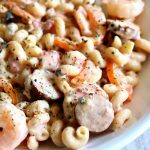 Does gnocchi have to be cooked first before putting in slow cooker? no, just let it cook in the simmering liquid in the slow cooker! What can I use instead of half & half? I can’t find that anywhere? you could use whole milk or even heavy cream! It’s not a big deal, it will still taste great. We enjoyed this with spinach. Good flavor though next time I will add a little red pepper. 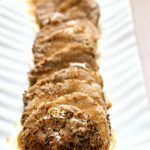 What would I do if using fresh (not frozen) chicken? you can take about an hour off the cooking time!